2014 in review – New drug approvals: what's the story? To date, the FDA has approved 35 new molecular entity (NME) and biologic license application (BLA) submissions in 2014, compared to the 27 it approved in 2013. Encouragingly, the administration is on target to approve a similar number of innovative pharmaceuticals as it did in 2012, when 39 new products were green-lighted; the highest number of approvals for a decade. In a recent blog post, FDA commissioner Margaret Hamburg provided a brief update on the administration's performance, noting that the FDA has approved 15 new drugs to treat rare diseases (versus a previous record of 13 such approvals in one year) and 15 drugs which are first-in-class molecules. Hamburg also noted that 34 of the 35 approvals in 2014 occurred on or before designated PDUFA dates, while more than 80 percent of actionable NMEs have been approved over the course of the year. It is impossible to fully assess the health of industry R&D based solely on the number of new drug approvals, but the signs are positive. This trend is further enhanced by the FDA's approval of seven new drugs in 2014 that had previously received Breakthrough Therapy Designation (BTD): Novartis' Zykadia, Gilead Sciences' Zydelig and Harvoni, Merck & Co.'s Keytruda, Boehringer Ingelheim's Ofev, Roche's Esbriet and Amgen's Blincyto. Given BTD status, these products arguably compete as the most important new approvals of 2014. Gilead's Harvoni – approved in October for the treatment of genotype 1 hepatitis C – will rightly be lauded as the 'biggest' new drug of 2014 (Spotlight On: Four important talking points to watch now that Gilead's Harvoni is approved). Preceded by the launch of Sovaldi in late 2013, Harvoni combines the active ingredient in that drug – sofosbuvir – with a second compound – ledipasvir. The result is a once-daily treatment for genotype 1 hepatitis C patients, which requires no exposure to interferon (or ribavirin for the majority of patients) and which in many cases can be prescribed over a duration of just eight weeks. In its first full year on the market, Sovaldi is forecast to generate a staggering $11.7 billion in global sales, according to consensus estimates. With many eligible patients switching to Harvoni, sales of the combined Sovaldi/Harvoni franchise are expected to remain consistent at around $12.3 billion next year and are forecast to stand at around $12 billion in 2019. 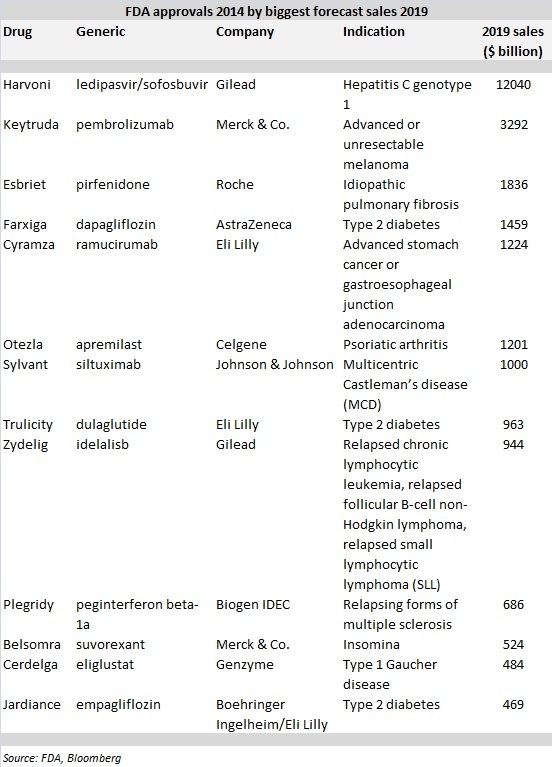 Identifying the most 'important' new drug approval of 2014 is more challenging. Harvoni is a solid candidate; Gilead has radically improved the way that hepatitis C is treated in just a few years, while simultaneously raising the issue of drug pricing in the US. While this is not necessarily a positive development for Gilead, its shareholders or biopharma investors in general, the issue of drug pricing in the US market is a key long-term question that the pharmaceutical industry needs to address. On the provision, however, that both of these factors were initially raised by the approval and launch of Sovaldi in 2013, many will argue that Merck's Keytruda is the most important FDA approval of the past 12 months (Physician Views Poll Results: The PD-1 inhibitor class lands – how do US oncologists expect to initially use Merck & Co.'s Keytruda?). Approved initially for the treatment of second-line metastatic melanoma, Keytruda is the first PD-1/PD-L1 inhibitor to receive regulatory clearance by the FDA. This class of therapies appears poised to deliver a significant breakthrough in the treatment of cancer. A handful of PD-1/PD-L1 products have demonstrated impressive and durable efficacy across a wide range of solid tumours, with this benefit also witnessed in some haematological cancers. This breadth of application underscores why analyst consensus forecasts for Keytruda in 2019 stand at $3.3 billion, positioning Merck's drug as the likely second 'biggest' approval of 2014. Bristol-Myers Squibb also deserves recognition; its PD-1 inhibitor Opdivo was the first drug in class to gain global approval in 2014 (in Japan), but is not expected to be cleared by the FDA until next year. Opdivo, for comparative purposes, is forecast to generate global sales of $4.4 billion by 2019, by virtue of being first-to-market in lung cancer. While the continued emergence of the PD-1/PD-L1 inhibitors has demonstrated significant advancement in the future treatment of solid tumours, 2014 has also seen dramatic progress in the development of new therapies for haematological cancers – as illustrated by the enthusiastic reaction to data recently presented at the American Society of Hematology (ASH) annual meeting (FirstWord Lists: Brief look at compelling themes from this year's ASH meeting). From a regulatory perspective, approval of Gilead's Zydelig for three different blood cancers continued the trend that saw Roche's Gazyva and Pharmacyclics/Johnson & Johnson's Imbruvica approved in late 2013. Furthermore, recent approval of Amgen's Blincyto further demonstrated the FDA's willingness to work rapidly in this area. A handful of other 2014 approvals are expected to generate blockbuster status by the end of the decade, one of which is Roche's Esbriet for the treatment of idiopathic pulmonary fibrosis (IPF). The Esbriet narrative has a number of sub-plots, one being that it is the drug that convinced Roche to acquire InterMune for $8.3 billion in August, and another being that the FDA approved Boehringer Ingelheim's competing IPF therapy Ofev on the same day as Esbriet in October. Next year should witness, therefore, a compelling commercial battle in the IPF market (Physician Views Poll Results: The idiopathic pulmonary fibrosis (IPF) market – let battle commence). To date, Eli Lilly and Merck have secured the joint-highest number of innovative FDA approvals in 2014, at three each. While Keytruda is a standout approval – as discussed above – it is Eli Lilly for which this tally is arguably more important with regard to overall performance over the next five years. Ramucirumab is expected to be the largest new approval in terms of end-of-decade revenue, while both Trulicity and Jardiance (partnered with Boehringer Ingelheim) will support the company's position in an increasingly competitive diabetes market. As demonstrated by GlaxoSmithKline's disappointing performance this year, however, regulatory success (GlaxoSmithKline achieved six NME approvals in 2013) provides no guarantee of strong top-line growth. To read more IAV Other articles, click here. 2014 in review – New drug approvals: what's the story? Morning glory! ViewPoints: Does rapid FDA approval drive increased usage of a new drug?